Breakfast smoothies are my go-to morning food. They are time saving, can be drank on the way to work plus there are so many different flavors that can be created, I never get bored. But not all smoothies are created equally or provide the same nutritional value. unique flavors create a thick eat with a spoon smoothie. Blend all ingredients except fresh strawberries. Pour into glass. Mash fresh strawberries and place juice on top of smoothie. Use a toothpick to swirl color in. Note - it would also be fine to add all of mashed strawberry in for a different look and texture. In March of 2015, I began using Shakeology when I looked at the ingredient list and was pretty impressed. I was willing to put my current protein powder aside and put it to the test. Within 3 months, my face had cleared up, my energy increased, my cravings were manageable, my thinking was clearer and my digestive tract was running like clockwork. Shakeology is more than a protein powder but made from whole food with vitamins and nutrients that support a healthy lifestyle. Even on days I miss my nutrition mark, drinking Shakeology secures my body one sound meal. 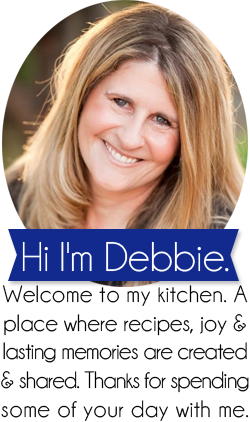 Want to know more – email me at debra.hallock@gmail.com Remember recipes give a direction to head but are suggestions and one can most the time exchange similar ingredients in an out to achieve general destination. 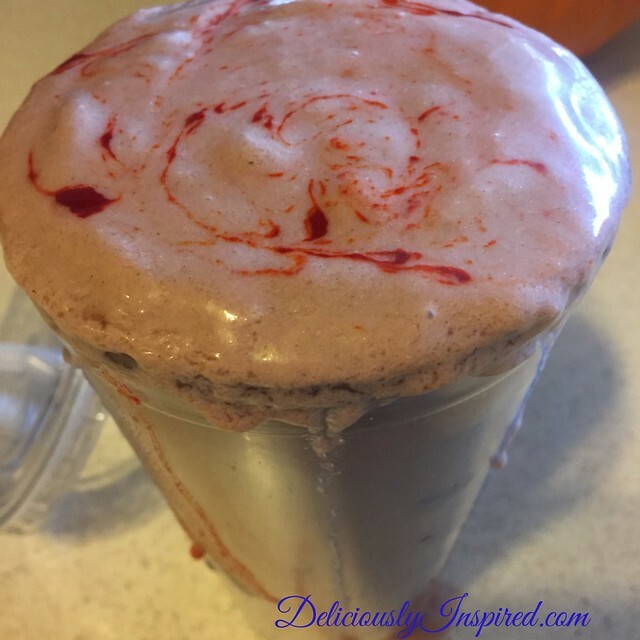 Do you have a special smoothie combination you really like? Hummus is readily available in stores and is wonderful to serve with pita bread and raw vegetables. 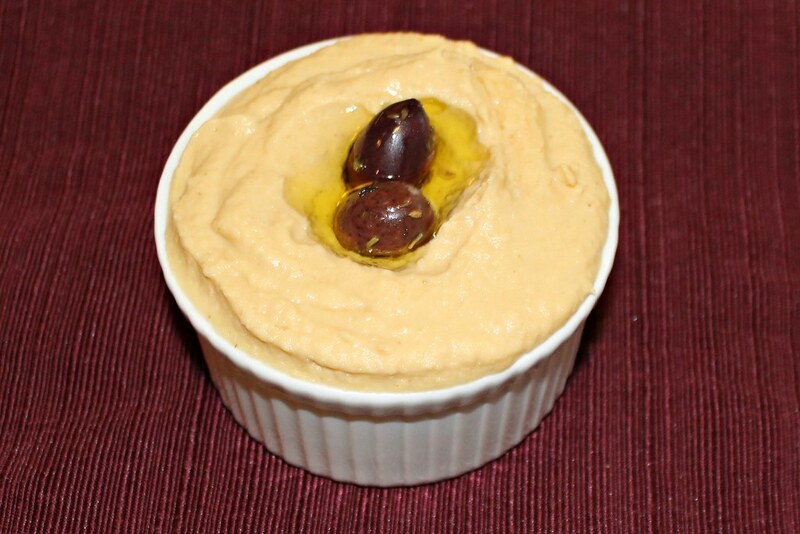 If you’ve never tried to make hummus, it isn’t hard, especially this recipe. It can be made with simple ingredients that are easy to have on hand in your pantry. A creamy spread that can be used with pita bread, fresh veggies and even on pizza. 1 (15 oz.) can of garbanzo beans, drained. Retain liquid. Drain garbanzo beans. Retain liquid. 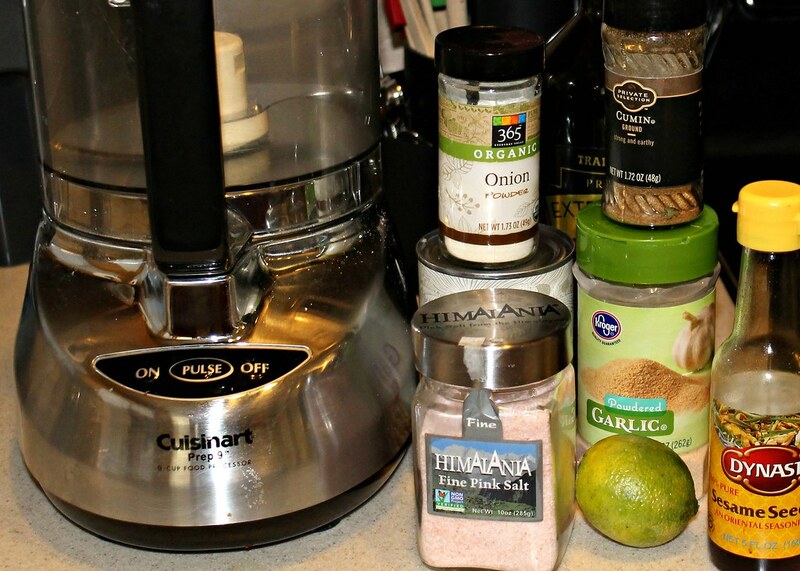 Place garbanzo beans and 2 Tbsp of garbanzo bean liquid in food processor for 1 minute. Add remaining ingredients plus 1Tbsp of garbanzo bean liquid. More liquid can be added for a thinner hummus. Place in a serving bowl. If desired take a spoon and create a small hole. Fill with olive oil and a few kalamata olives. Tahini is normally used in hummus recipes. I've replaced that taste with sesame oil because I always have that in my cupboard. The amount of garlic can be adjusted to taste. Invest in the right kitchen tools – There are more expensive tools to squeeze a lemon or lime but this wooden juicer is my tool of choice. 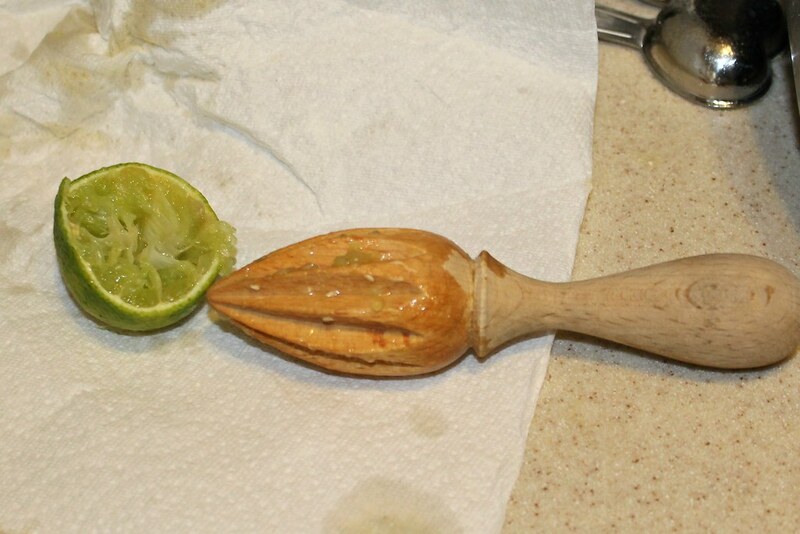 Tip: Roll lime on the counter a few times before cutting in half to release the juice. I love my Cuisinart Food Processor. It’s an old friend and is my go to tool when making hummus, almond joy ball or pizza dough. I use this salt in all my cooking – just because a product tastes salty doesn’t mean it’s giving your body the best nutrients. If you’ve never bought this type of salt before it will seem pricy but there is a difference. 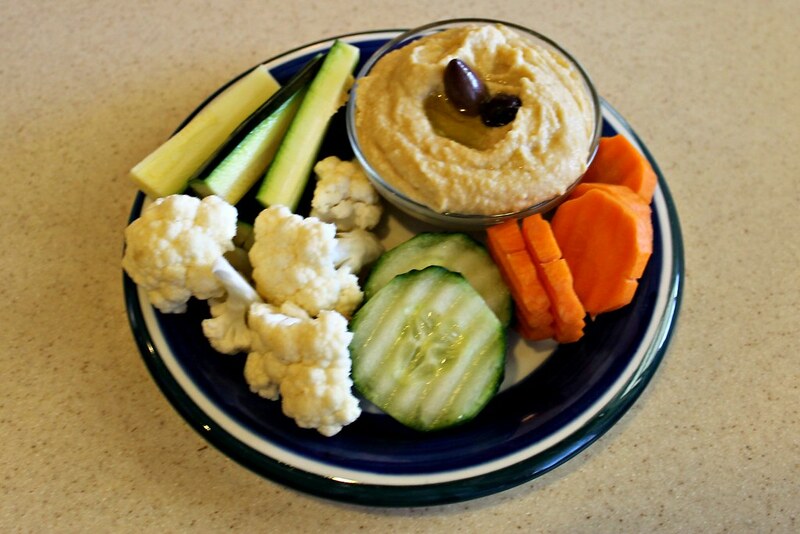 Prepare an assortment of veggies and enjoy the hummus. The affiliate links I’ve attached help to support the expense of the blog when suggested products are purchased by clicking. Many thanks to helping me continue to share. 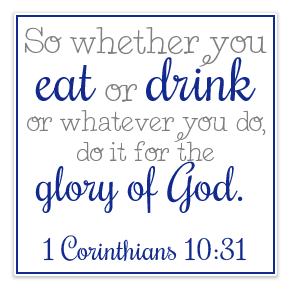 PS – I often will break down recipes and share other information than what’s on the blog so please consider following me on Facebook, Instagram, Bloglovin – all buttons are in upper right of page. 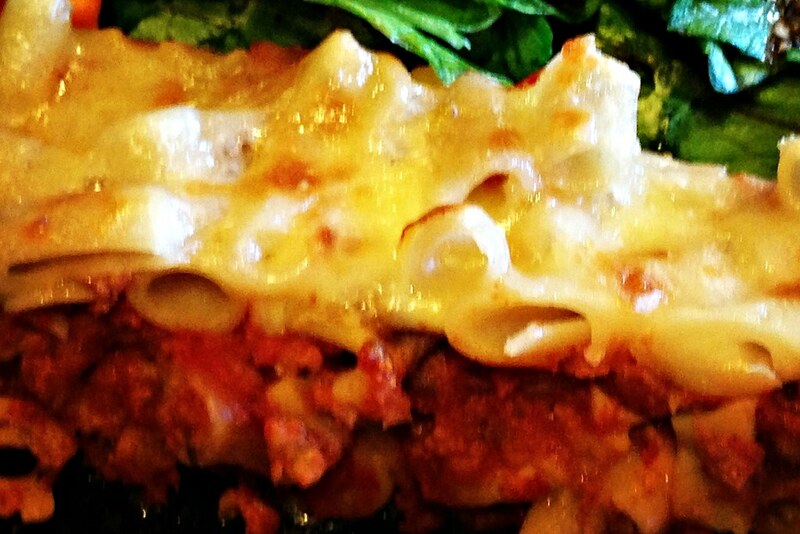 When I was a child one of my favorite meals my mom cooked was her lasagna. It was good all year round but my happy memory is when I would come into the house on a cold winter California day from school and smell this dish in the oven. As I began cooking for my own family I appreciated the ease of this recipe. So I’ve tweaked it a bit for me since I don’t eat much meat these days but am also including how I make it for my meat eating-gluten-free husband. I use Trader Joe’s Brown Rice Pasta which makes this lasagna a little different because it uses rotini and not the long traditional lasagna noodle. Serve with side salad and you are good to go. Remember dishes like this are always extra good the next day. Prepare and 8 x 8 square pan or a 10 X 6 oblong pan with vegetable spray. In a bowl combine meat and sauce and combine well. Set aside. For non meat version – saute mushrooms in a skillet sprayed with vegetable spray. This will give the mushroom a meat like texture and remove some of the moisture so the lasagna isn’t soggy. Drain on a paper towel and set aside. Bring a large bowl of water to a boil. Add pasta, stir often for about 8 minutes. This is a reduced cooking time listed on the package but the pasta will finish cooking in the oven. Then drain and rinse under cool water. Pat with paper towels to get as much of the moisture off the noodles. Now you are ready to assemble..
First Layer – Place half of the meat sauce in prepared pan and spread evenly. *Non-meat version – Add a layer of mushrooms on top of meat sauce layer. Third Layer – Spinkle half of the cheese over pasta. Cover with foil and bake for 45 minutes covered. To crisp up the top – Turn broiler on low and watch very carefully. This will only take a few minutes for it to get golden brown. Now is the hardest part in our family…Let rest on a cooling rack for at least 15 minutes before cutting into. Note: For a 9X11 pan – double ingredients. 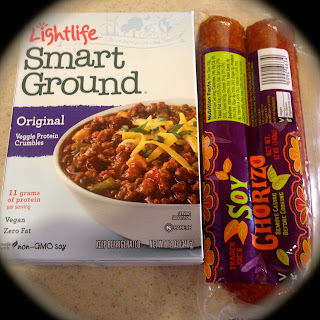 Here are the meat alternatives I use. 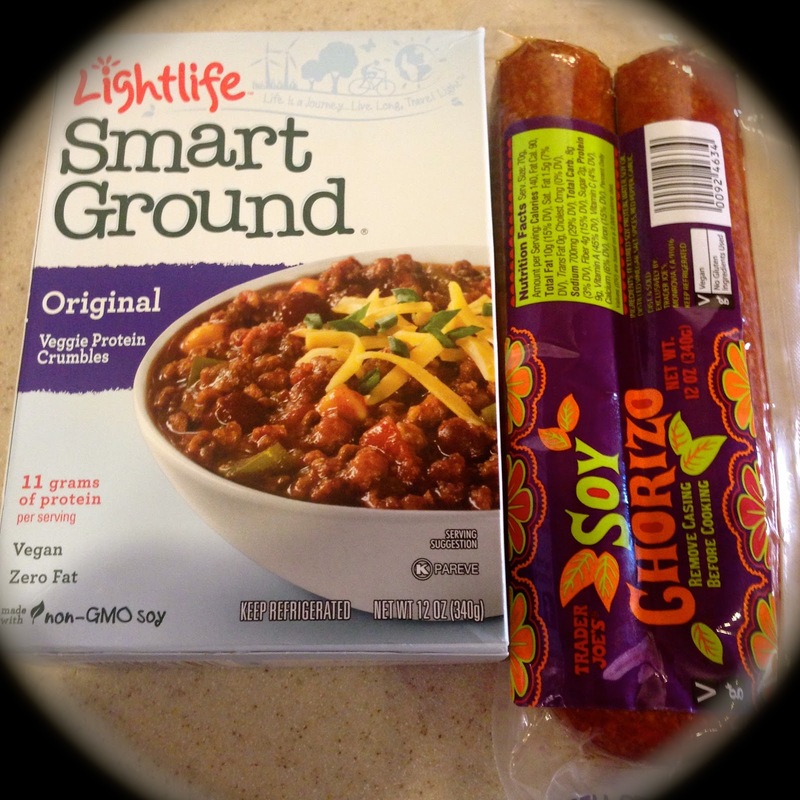 I have found the Lightlife Smart Ground Crumbles at Fry’s Marketplace. The Soy Chorizo is a Trader Joe’s product.